Snow in the Deep South is a rare sight, but that doesn’t keep us southerners from hopefully wishing for a white Christmas. These festive treats make a beautiful addition to your holiday table and add the appearance of “snowballs”. 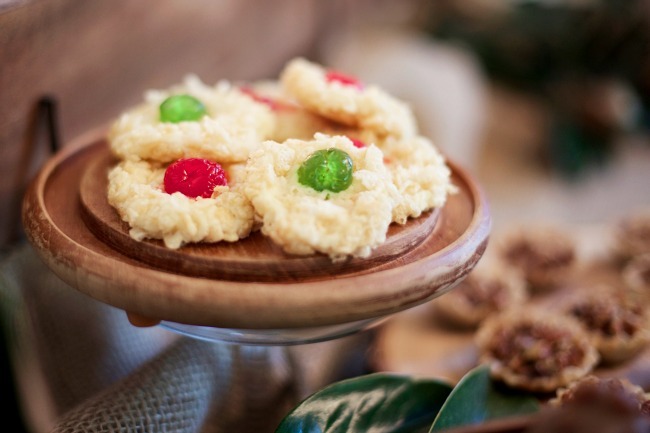 Be sure to give yourself a little time in the preparation of these treats as the 1-2 hour chill time is critical to their presentation and helps them bake evenly. Although these “snowballs” are far too tasty to throw, make plenty and enjoy them with those you love, give as gifts or bring to your next cookie swap. Cream butter, cheese, sugar and almond flavoring until light. Sift flour, baking powder and salt. Stir in butter mixture just until combined. Chill 1 to 2 hours. Shape into balls, roll in cereal and place on ungreased cookie sheet. Top each with a cherry. Bake at 350 degrees 12 to 15 minutes. Cool on racks. Makes 4 dozen. I have made these several times over the years for the holidays. They are always a hit, and look so festive too.